For 12 years, Dr. Eric Norton was an outside consultant for NASA and the National Security Agency (NSA). His job was to keep an eye on celestial threats such as asteroids and comets. But in January 2012, Dr. Norton saw something much more menacing—a massive fleet of extraterrestrial craft heading straight for our home world. “What I saw was an array of massive, three-dimensional black structures in space, in a straight line formation, advancing in the direction of planet Earth,” said Dr. Norton. “I knew that the upper echelons of government were worried about these things because I was under a constant 24/7 guard by Secret Service agents. In December 1980, aliens allegedly landed in Rendlesham Forest, England in a triangular spacecraft. Sergeant Jim Penniston said that he initiated a download of information when he touched the pictorial glyphs on the craft of unknown origin during his investigation “I had my notebook and camera while I was out there, so I began taking notes. This is what I wrote: ‘Triangular in shape. The top portion is producing mainly white light, which encompasses most of the upper section of the craft. A small amount of white light peers out the bottom. At the left side center is a bluish light, and on the other side, red. The lights seem to be molded as part of the exterior of the structure, smooth, slowly fading into the rest of the outside of the structure, gradually molding into the fabric of the craft’. Jogn Burroughs — Airman, U.S.
Burroughs won a legal bid to force military health chiefs to pay for the treatment of an illness allegedly caused by a UFO encounter in Suffolk. He was involved in an incident in Rendlesham Forest in December 1980 which has become known as “Britain’s Roswell”. 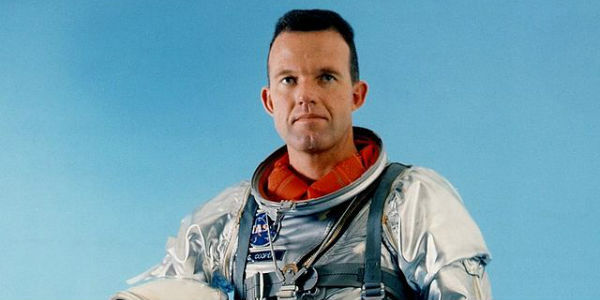 Gordon Cooper — NASA Astronaut, U.S.
Gordon Cooper was the final astronaut for the Mercury program. Cooper had personal sightings of flying saucers including his first while flying over West Germany in 1951. As more colleagues recounted similar sightings he became an advocate that the phenomena was very real. “I believe that these extra-terrestrial vehicles and their crews are visiting this planet from other planets. Most astronauts were reluctant to discuss UFOs… It started in World War 2, when the government didn’t want people to know about UFO reports in case they panicked. Capt. Edgar Mitchell — NASA Astronaut, U.S. The UFO matter is simply the tiny, tiny tip of an iceberg which is so enormous that when the truth comes out, its going to change the whole world. Bob Lazar — Physicist/Engineer, Area 51, U.S. In 1989, Lazar contacted the Las Vegas television station (KLAS) and claimed that he had been working as a physicist on the government’s most highly classified project, Galileo, which involves back engineering alien technology. “I am exactly sure of what I saw. In January 1946, Marcel was assigned to the 509th Composite Group at the Roswell Army Air Force Base. In July 1947, Marcel found himself the center of attention when he brought in the debris of a “Flying Disk” that Mac Brazel had found on Foster’s Ranch. He said the material at Brazel’s ranch had highly unusual physical properties beyond human technology and was “not of this earth,” definitely NOT balloon material of any kind. He further added that the material publicly shown by Ramey in Fort Worth was a substituted weather balloon swapped for the real debris he had brought Ramey from Roswell. The video above shows Laura exposing her attempted recruitment from April 2006 through January 2007 by a secret Mars colony project. Larry Warren, a former British airman, is one of the people who claim to have witnessed several nights of UFO sightings in Suffolk, in 1983. Warren said that he confronted a triangle-shaped craft along with a few other people. Official memos have been released, and footage collected. There’s even a tape that became public of authorities measuring radiation samples in the area.